Lutheran Colportage: John Keble - hymnwriter -Was Keble a humble minister? John Keble - hymnwriter -Was Keble a humble minister? 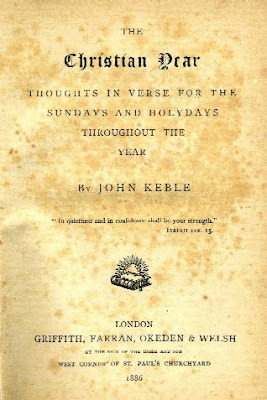 The title page of the Christian Year by John Keble published in 1886. He was born on St Mark’s Day, April 25th 1792 at the family home in Fairford (now Keble House), the son of another John Keble who was Vicar of Coln St Aldwyns. He was taught at home by his father until in 1806 (not yet 15 years old) he won a scholarship to his father’s old Oxford college, Corpus Christi. In 1810 he took a double first in classics and mathematics: very few had ever managed this before (Sir Robert Peel being one of them) and Keble at just 18 was probably the youngest ever. In 1811 he was elected a Fellow of Oriel College, where the Senior Common Room at that time had a reputation for its outstanding intellectual abilities. He was ordained Deacon in 1815 and Priest the following year and was appointed curate of Eastleach Martin (or Burthorpe) and Eastleach Turville. In the university vacations he lived at Fairford and served his parishes from there: in term time, he and his brother Thomas took it in turns to go out from Oxford on Sundays, and their father looked after things during the week. He was a College tutor from 1817 to 1823 when his mother died. He took on Southrop as well as the Eastleaches and lived there taking in pupils. In 1825 he went to be curate of Hursley near Winchester but next year returned home. His favourite sister Mary Anne had died and Keble served as curate to his elderly father until he died at the beginning of 1835. In October 1835 he married; and at the end of the year he returned to Hursley as Vicar and remained there until his death on 29th March 1866. Why is Keble important? We have mentioned his hymns. He was not actually a hymn writer but a poet and compilers of hymn books have generally selected verses from his longer poems. The best known collection is ‘The Christian Year’ first published in 1827. It contains poems for each Sunday of the year and the other Holy Days. Over 100.000 copies were sold in the first 25 years, many more after his death and it is still in print. Lyra Innocentium followed in 1846, published to pay for the restoration of Hursley Church. It was the National Apostasy Sermon which Keble preached in 1833 in St Mary’s Oxford, that John Henry Newman took as marking the beginning of the Oxford Movement, where leaders (mainly Keble, Newman and Pusey) are also called Tractarians because of Tracts for the Times they published. Many think the Oxford Movement was to do with ‘High Church’ and ‘ritualism’. It was not. It was the revival of theology, a re-discovery of our rootsi in the teaching of the ancient Church fathers (many of whose writings were translated by the Tractarians). It was a revival of discipline and holiness. They were men of great piety and earnestness which makes them seem humourless, which contemporaries tell us they certainly were not. I found the following in The New York Times archive of July 11, 1903. In your issue of June 27 "Hymn Studies" concludes a very pleasant letter about some very fine hymns by asking: "Would like to know where the entire poem entitled 'Sun of My Soul, Thou Saviour,'can be found." Compilers of hymn books have taken the liberty with this poem by giving it the name or title of the first line of the third stanza - "Sun of my soul, thou Saviour dear," and this has probably misled your inquirer. Fast fading from our wistful gaze." There are many other fine poems in this book, which will doubtless delight "Hymn Studies," but does he not make a mistake in calling Keble an humble minister? He was very High Church, and I think it a contradiction in terms to call a "High"-Churchman humble.